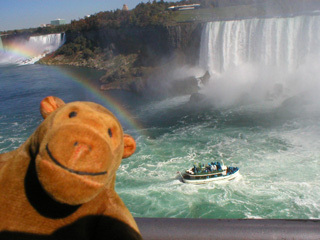 "It all looks appallingly damp, you know"
Looking down, Mr Monkey noticed a rather pleasing rainbow, and a Maid of the Mist venturing very close to the waterfall and the spray. Mr Monkey began to wonder if he really wanted to have a boat trip at all. Click on either picture for a bigger image. 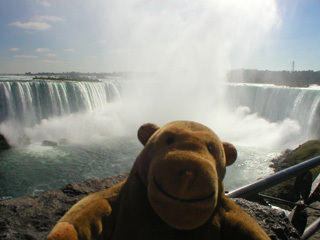 You'll need to use the back button, or the backspace key, to get back here.